Barbara Morant spent a crucial part of her childhood in the unremarkable suburban house which lends this novel its name. For her siblings, it’s merely a place to live; for her mother, it’s a symbol of the provincial drudgery of suburban living. But for Barbara, the house and the routines of those years are invested with a halo of happiness, and she yearns for them long after the family’s return to London. Her obsessive nostalgia, the pursuit of her childhood joys, lead her to attempt a recreation of the past. She leases the house, undoes the changes made in the intervening years, and moves in, only to find the past irretrievably changed and changed by her later knowledge and experiences. 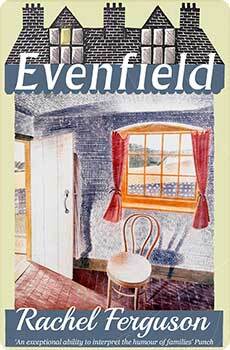 Lushly packed with domestic detail and references to popular culture, household products, advertisements, songs, décor, and pastimes, Evenfield provides us with a hilarious but surprisingly profound exploration of childhood and the way it’s remembered (and misremembered) by adults, and of the vanity of searching for lost time. Rachel Ferguson – known for earlier classics The Brontës Went to Woolworth’s, A Footman for the Peacock and Alas, Poor Lady – gives us here her own unique variation on Proust. This new edition includes an introduction by social historian Elizabeth Crawford.